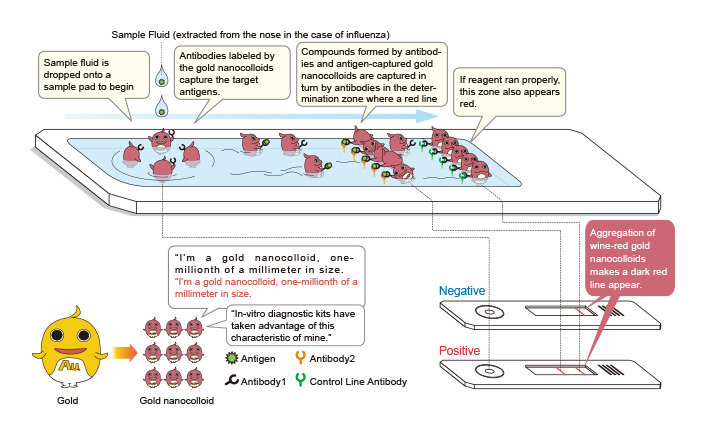 Nano-sized gold colloids are used with in-vitro diagnostic kits (immunochromatography*1) that enable fast and simple, early detection during influenza and pregnancy testing, allergen detection, and detection of some forms of cancer and other diseases. *1. Immunochromatography is an analytical method enabling fast and simple visual determination of the existence of antigens in a sample (blood, etc.) by using capillary action of porous media.